Inspired heavily by the Ex Astris End Cake, this mod aims to have delicious food-themed transport. Cakes for everywhere. Does not appear to work when used from other worlds. We have a SkyFactory 3 server. We were using ItsBecauseUHasNoGoodSpawn/YUNoMakeGoodMap to manage island creation/tracking but that ended up causing huge problems. I created a new world and we are now using SkyClaims to manage islands and are giving people time to get their stuff from the old world and move it to the new one. The End Cakes work fine from the old world, but when placing one in the new world, they do not work. It places, and you can fill it with the Eyes of Ender, but once full, clicking it just removes a slice, no teleportation to the End. It might be because you don't have an end world for the cake to teleport you to. I just noticed this reply (got busy with too many projects IRL and got behind on some issues I have been trying to sort). Is there a way to tell the cake we want it to go to the existing DIM 1 End that is in the server? Add a 1.10 version support for the 1.9 one so it can be seen on the curse launcher. Porting to 1.10.2 and 1.11+ would be awesome so it can be used on packs on a cleaner way, even when the actual version works on 1.10.2 Curse makes it a little bit more complicate to use the mod on a pack. Are more dimension still on the menu? 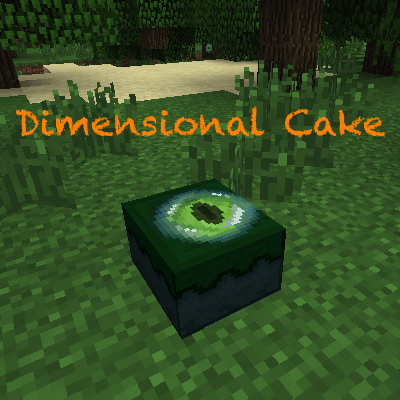 That's something I would love to see, like Nether Cake, and also a way to config more cakes depending on the dimensions on the pack we use it on. i can see it in JEI but in the world its just a sliver of cake not a full block ? You have to fill the rest with Eyes of Ender before you use it.